The pure white color of Bianco Dolomoti tiles make them an excellent choice for high-end homes. Your clients are trusting you to provide them with upscale options that are durable and attractive. They want building materials that can withstand the test of time and add a luxurious look to the home. When you need beautiful white tiles, Bianco Dolomoti is the right choice. Here are some of the ways you can incorporate this sophisticated material into your high end designs. Brilliant white tiles marching across a bathroom make the space look larger, but you can make the tiles more impressive by adding darker accent colors. Use narrow strips of dark granite between the marble to form an incredible pattern and make the area even more impressive. Choose a bold, large pattern for larger rooms, but shrink the pattern down when working with smaller spaces. The deep colors in the accent tiles will help show off the delicate veining and bring out the striations in the marble. 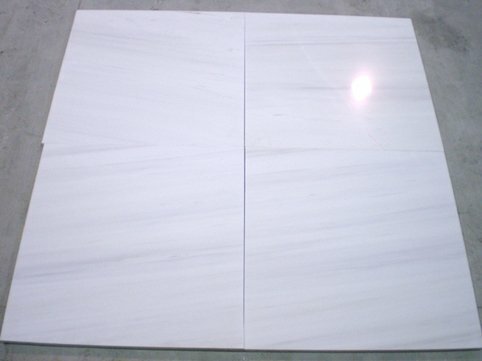 At the same time, the contrast will make the marble seem brighter, white and more impressive. Home buyers and clients expect to see marble tiles on the floor, but you can make a better impression by using it in unexpected areas. Fill a recessed area in one bathroom wall with marble, and then fill the space with glass shelves. It provides homeowners with storage where they need it most, and the combination of tile and glass creates a sophisticated look that brings the powder room to the next level. Install marble on window sills, door thresholds, around mirrors and in other unexpected spaces. It can be used as countertops, on tables, and even as a decorative accent. This type of attention to detail will make a great impression on customers and ensure that they’re pleased with your style and design ideas. People know that marble is commonly used on floors, but they forget that it can also be used in vertical applications. Don’t choose simple fiberglass for the shower walls when you can use marble and create that high-end feel. If the home features wood floors and wood treads on the stairs, incorporate marble in the risers to add a luxurious feel. Use it on the kitchen backsplash, one wall in the foyer or on the bathroom walls to surprise and delight your customers. Finish off the fireplace with a sophisticated tile surround and hearth. It will make the entire room feel more upscale, and guests will always be impressed with a fireplace featuring beautiful Bianco Dolomoti marble with its white color and delicate veining. The neutral color ensures that it will work beautifully with any décor, and your customers will appreciate the ability to make this marble work with any design plan. At the same time, they’ll love how easy it is to clean and maintain. It adds a premium to the price of the project, but most customers are willing to pay a small premium when it means they can enjoy upscale building materials like Bianco Dolomoti in their home. Bianco Dolomoti works alone but it’s also a team player. The beautiful white colors and soft veining can be paired with wood floors, glass walls and mirrored surfaces. Whether you’re working with carpet in some areas or black stones, the white marble will be a perfect accompaniment. It can take center stage as the highlight of the room, or it can be an accent that helps bring out the color and texture in other materials. It’s versatile enough to work with any building material from traditional to contemporary, and it’s attractive enough to be the central focal point in any room that needs to be spiced up. This building material is commonly found in bathrooms, and it’s also a top choice for kitchens. It matches all colors and makes any space feel more warm and inviting. What you may not realize is that it’s also perfect for the home office. Contemporary and traditional furniture look amazing with Bianco Dolomoti, and it will match any design theme. This allows you to enjoy a home office that’s easy to care for and attractive. When clients come to your home, they’ll be impressed with the upscale added touch. It’s also the right choice for bedrooms, foyers, living rooms and any other area in the home. Part of the appeal of Bianco Dolomoti is the way it opens a space visually while making it more inviting. Light colors are known for visually expanding an area to make it look larger. However, it also makes it look larger by reflecting light. Just as hanging mirrors can fool the eye, choosing a highly polished Bianco Dolomoti can also trick the eye into thinking an area is larger than it is. However, the use of mirrors can make a space feel cold and uninviting. This isn’t an issue with Bianco Dolomoti. The warm colors are inviting and relaxing, so the home or business will feel more welcoming as well as larger. Bianco Dolomoti can be used alone or mixed with other stunning colors. It looks incredible with darker shades, and it can also be the perfect accent to light tans. Create a monochromatic theme that is sure to impress, or bring in bold blue and watch the Bianco Dolomoti shine. Use it as a border to draw attention to the size of a room or an architectural detail. These tiles are the perfect choice for any high-end project, and your clients are sure to love the addition. There are countless way to incorporate Bianco Dolomoti into your upscale design plans. It makes any home look more attractive and welcoming while creating a luxurious feel. You can drastically expand a space visually while ensuring that it feels elegant. Your customers will be impressed with the luxurious choice, and they’ll appreciate your attention to detail. Contact us to learn more about our services and our selection of stunning Bianco Dolomoti marble tiles.